The original Quattro gearing was a triple chainring and an extended Capreo block with a custom derailleur. Although this worked OK, I didn’t trust it to take me all the way across the USA. 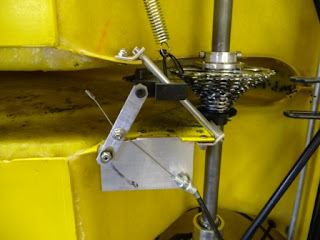 I decided to fit a standard short cage 105 derailleur, with an extra custom tensioner to take up the slack. The gearing for ROAM was 72T, 60T & 45T chainrings and a standard Capreo 9 speed block, 9T, 10T, 11T, 13T, 15T, 17T, 20T, 23T & 26T. This gives a top gear of 72x16/9 = 128” (10.3m) and a bottom gear of 45x16/26 = 27.7” (2.23m), which is a range of 462% but I was badly over-geared on hills over 10%. What I would like to try is a single chainring and a straight chain line. The extended block slides left and right on some kind of spline and the tensioner is fixed. Aiming for a gear range of 500% based on the Capreo block, there are three relatively simple options. This gives some nice close ratios for racing but I discard most of the expensive Capreo Block. This gives slightly wider ratios but is physically narrower and nothing is discarded. This gives nice close ratios for racing and as many gears as a Rohloff Hub! They all give a top gear of 72x16/9 = 128” (10.3m) and a bottom gear of 72x16/45 = 25.6” (2.06m). For any future tours I would probably reduce the chainring to say 65T. Giving a top gear of 65x16/9 = 115.6” (9.31m) and a bottom gear of 65x16/45 = 23.1” (1.86m). It was easier to make an MDF mock-up of the tensioner shape and position, than to try and draw it on the computer.